alkaline/acidity balance as central to health are quacks that peddle a pharmaceutical pill for every ill, a drug for every bug. pH stands for power of hydrogen, which is a measurement of the hydrogen ion concentration in the body. The total pH scale ranges from 1 to 14, with 7 considered to be neutral. A pH less than 7 is said to be acidic and solutions with a pH greater than 7 are basic or alkaline. Our ideal pH is slightly alkaline – 7.30 to 7.45. You can test your pH levels regularly by using a piece of litmus paper in your saliva or urine first thing in the morning before eating or drinking anything. 1. Digestive System – Most digestive disorders, such as indigestion, nausea, bloating, gastric reflux, are symptoms caused by excess acid in the gastric region and not enough alkaline minerals in the intestinal tract. 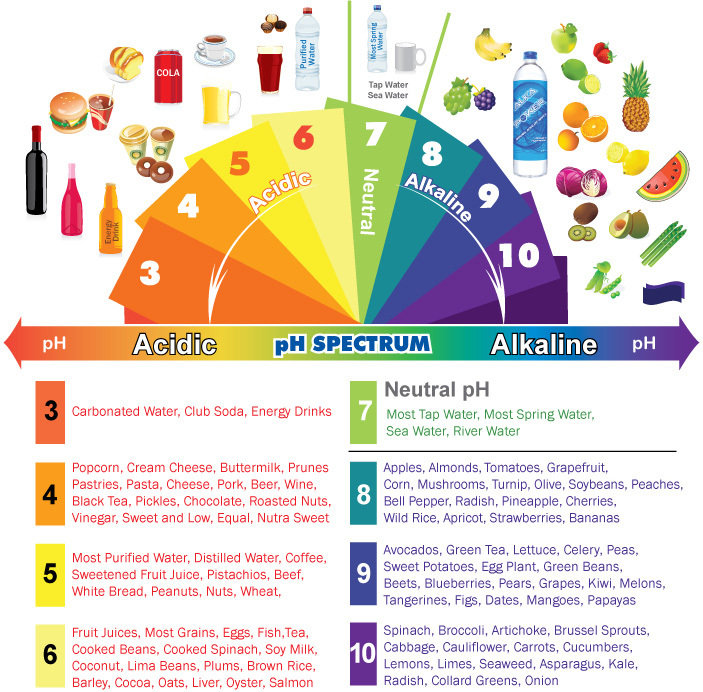 If the alkaline minerals from enzyme rich foods are missing then the pancreas will become exhausted, and once the pancreas is exhausted, it loses the ability to decode the food and tell the body what to do with it. This will lead to a degenerative spiral of entropy where organs become confused and inflamed. 2. Circulatory System – Acidity is the principal cause of heart disease. It is well established that many fats are extremely important and essential for cardiovascular health. Good fats can actually help heal the inflammation that underlies arteriosclerosis. When the arteries thicken with plague it is not as a response to good fats, it is inflammation created by the internal acidic environment. The body responds to the acidity by lining the vessels with fatty plaques to prevent life-threatening leaks, which arrest imminent death, but strain the heart because the aperture for the blood to flow through is narrower. When the heart becomes completely exhausted, this is known as a heart attack. 3. Immune System – Acidic environments are breeding grounds for anaerobic pathogens whereas the high levels hydrogen of rich body fluids keep bad bacteria inactive. As the great scientist, Antoine Béchamp famously observed ‘The germ is nothing, the terrain is everything.’ Whether bad bacteria and pathogens incubate or remain dormant, all depends on the ratio of cellular pH. The germ theory is a narrow view that has been adopted by the current medical establishment, which conveniently relies on a profitable cut, burn, and poison approach to sickness. Surgery, radiation, and pharmaceutical drugs are an invasive approach that is ineffective because they works against the body’s natural functions to heal itself, and it fails to address the underlying cause and only treats the symptoms. 4. Respiratory System – When the tissues and organs are overloaded by acidity the transport of oxygen is strangled. This suffocation means the cells cannot breathe properly. Every cell in our body needs to breathe new oxygen and to clear acidic carbon dioxide to function correctly. When the ratio of acidity is too high then wastes in the form of mucus and infections and viruses build up in our lungs, which leads to colds, bronchitis, asthma, etc. 5. Skeletal System – Arthritis is one of the most disabling diseases in developed countries. The word arthritis means “inflammation of the joint” and is used to describe pain, stiffness, and swelling in the joints. The two main form of arthritis are Rheumatoid and Osteoarthritis. Both forms are related to pH imbalance and accumulation of acid deposits in the joints and wrists. It is this accumulated acid that damages cartilage. When the cells that produce the lubricating synovial fluids and bursa fluids are acidic, this condition causes a dryness that irritates and swells the joints. When uric acid builds up it tends to deposit in the form of crystals, like broken glass in the feet, hands, knees and back. Osteoarthritis is not a ‘wear-and-tear’ condition. Arthritis can be arrested and reversed using a specific protocol that I have developed using alkaline minerals and Yoga. 6. Integumentary System – Commonly know as the skin. When the body’s pH is out of balance then the build up of acid causes inflammation and the skin is less able to function as a natural barrier against infection. As a result, the skin tends to develop lesions and sores open to the surface of the body, and the formation of skin eruptions occur like pimples or rashes. 7. Nervous System – Acidity weakens the nervous system by depriving it of energy. This is also known as ‘devitalizing’ or ‘enervation’. It makes the physical, mental, and emotional body weak. 8. Excretory System – This is also known as the urinary system. It is made up of multiple organs, the main one being the kidneys. The kidneys perform the task of filtering fluids and purifying our blood. If the body is overwhelmed by excess acids, compensatory mechanisms spring into action, one of them is the pulling of alkaline minerals from your bones and dumping them in the blood. If this occurs frequently enough, the minerals build up in the kidneys in the form of painful kidney stones. 9. Muscular System – When acidity increases in the muscle cells, it disrupts the metabolism breakdown of glucose and oxygen to energy. This means muscles perform poorly in an acidic environment. An alkaline system on the other hand allows for much better aerobic metabolism and energy for the body’s recovery from strenuous exercise. I can often observe when someone is acidic from their breathing because they take large gulping inhales while doing the simplest tasks like walking and talking, which suggests their body finds it difficult to adequately deliver oxygen into the cells – a symptom of acidosis. There are many more diseases and disorders that are associated with an acidic condition – cataracts, osteoporosis, gout, cancer, migraines, constipation, morning sickness, stroke, allergies, diabetes, obesity, etc. With this awareness of how acidity affects us, we can all choose to make informed and empowered healthy decisions for wellness and inner peace through deeply strengthening practices like yoga and nutrition.